Now moving on the topic of discussion. Timeranger episodes 18-20 foreshadow a lot of events. Yes, there's some massive foreshadowing with a lot of dialogue. If you haven't watched these episodes or Timeranger then I suggest you watch them -- unless you don't mind being spoiled. So here's what's going on -- the future is uncertain. The Timerangers are in the past and things are about to get better (or worse) which I believe events within the Asami family may have also negatively affected Captain Ryuya in the future. Who knows that maybe events with Captain Ryuya were meant to happen differently or what? But I'd dare still accuse him of neglect which led to the show's events -- plus he's a foreshadow (in some way) to the Overlord of Darkness in Kamen Rider Agito and later Masato Kusaka in Kamen Rider Faiz. The first foreshadow ends up with the whole plot with the Zeta-3 Crystal and the Lambda 2000 -- both play a huge rule in the finale. The use of these elements in the present time is starting to change history for better or for worse. The Timerangers feel the distortion effect and they see doppelgangers of themselves -- which almost had me thinking, "WTF -- is this scene a preview of Kamen Rider Agito's nightmarish finale?!" Both forms of energy should have never been part of the Year 2000 -- this anomaly in time starts a huge time shift. Time can get disrupted which would lead to the Great Annihilation in the Year 2001 -- which also somewhat foreshadows the Overlord of Darkness' "drastic measure" to save humanity from itself. There's also the scene of Domon's great pessimism. I just felt sorry for Domon and I wonder WTF why did Yuuri even slap him at the face in that scene? Domon's words almost felt like telling the audience about what could be the true anomaly within the Time Protection Bureau. He yelled at Tac hoping it'd reach the Time Protection Bureau. So why was Captain Ryuya only sending mecha whenever it's convenient and did he even think about the lives of the Timerangers on how it could change history? At this point, I feel like Captain Ryuya foreshadows the Overlord of Darkness in Agito -- both want to create a bright futures but tend to act only when it's convenient for them. I really wanted to slap Yuuri back at her face for hitting Domon -- though I may have also committed the same mistake in her place! Domon was getting whiny if you ask me! 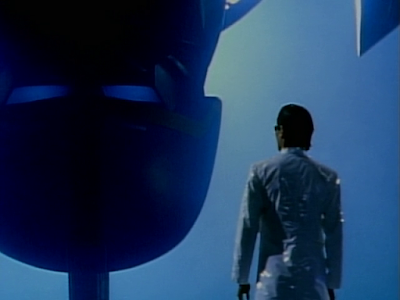 Should I mention the scene that was sang after Domon is slapped is actually the final theme song of Timeranger? It's called "The Future's Location" -- I even think about how the song was talking about the distance between two futures and fighting fate itself as the ultimate villain of the series. It was the song that was later used after Timeranger ended. The Timerangers go forward to fight destiny regardless how tough it is. It almost reminds me of Kamen Rider Agito where the protagonists are actually fighting fate personified in the Overlord of Darkness. The heroes are doing everything to struggle against the path of fate itself. Anyway, I don't know when this debate will resume. But right now, I just want to focus on Lupinranger vs. Patranger or finishing O2O Romance ASAP. I'll be out for awhile which means that one of my Lupin vs. Pat reviews may end up getting later than a Monday yet again. But right now, I'll just leave a foreshadow that one of my weekly reviews will definitely meet a huge delay.